I attended a very special event, my nephew is getting married and he and his fiancé were given a very lovely shower. Everything was beautiful! The couple was more than grateful for the outpouring of love given to them by the attendees and were overwhelmed with joy. Marriage is sacred to our Heavenly Father because it reveals the likeness of our relationship to Jesus. It’s a commitment, and there will be days that are good where everything goes our way, but then there will be others where we struggle to get through. We really don’t always understand that going into marriage or salvation. “Love is blind” and “blind faith” can describe both marriage and salvation. There is always a honeymoon period, but once that wears off, real life begins and there’s nothing sweeter than experiencing a wonderful life together, with each other and our Savior. A couple of days ago, I ordered a new cover for my iPad that was supposed to have already been delivered. I’m not exactly sure what caused the delay, but with the bad weather, moving trucks and tree trimming equipment blocking the road, I’m not really surprised that it didn’t make it here. However, because of good customer service, I should be getting it sometime today. There are a lot of things that may cause delays in our prayers being answered, somewhat like the delay in my package. My best guess would be that most delays aren’t really delays at all. Just because we ask God for something today, doesn’t mean that it’s a part of His plan. God is not your genie in a bottle! He is the Creator and our Sustainer, and His timing is perfect! Though you may feel desperate, remember how good He has been to you in the past and use that as a memorial stone. He’s still right there with you every step of the way. Take a deep breath and trust Him! Then our radical Savior came along and healed those who believed in Him! Then sent them to the priest. He had cleansed them from their sin, which only God can do! This was proof to the Jews that He was who He said He was. He came to do what no other man could do - save us from ourselves! What an awesome God we serve and what a precious Savior to cleanse us of our sins! We went through a very dry season, but now it’s been raining for days! We may continue to receive rain for a while. At one point the rain was heavy, the wind was blowing, small tree branches were pelting against the house, and you could hear the thunder and see the lightning. I thought the windows were going to blow out! It’s funny that the next scripture in my Bible reading dealt with the same issue. I’m always amazed when I see pieces fall into place by the mighty hand of God. Do you ever feel like that, like a house in the middle of a storm? Everything coming at you at once? Sometimes people yell at you like thunder, lightning is striking all around you, with strong winds from others trying to shake you off your foundation, and then you get pelted with things flying. You’re still standing; maybe bruised and battered, but still standing because you’ve built upon the solid rock of Jesus. You will not be shaken or destroyed! Be careful out there, big brother is watching! I just got some new electronics and was so excited about this new technology. There are some wonderful new features that I can’t wait to explore. 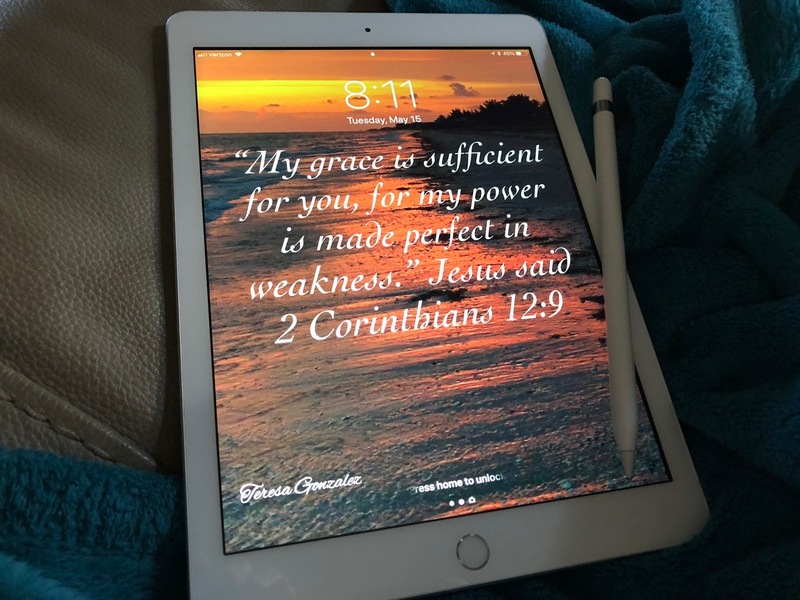 Last night I was tinkering with the new Apple Pencil; my daughter had sent me an email and I decided to respond by marking it up with the new pencil. I took a screenshot, drew on it, made some notes and sent it back to her. A few minutes later, before she even saw my email, she called me and asked if I had screenshot it. She had gotten a notification! We were both blown away and freaking out a little. Gone are the days of being stealthy about your actions. We know God is watching, but now man has his finger on us too! Keeping your motives pure is the best way to be and is a godly attitude to have; that godly attitude may now be able to keep you from being embarrassed and out of trouble. There is a native plant that grows up in the trees here in Florida that’s hardly ever noticed until it rains. If you do see it before the rains, it looks dead. 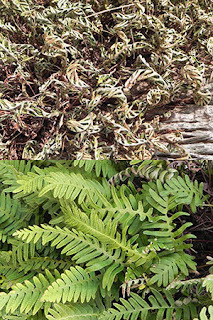 It’s called resurrection fern. It goes from a dead, dried up looking, shriveled brown mess to a vibrant green, fully alive fern within a matter of hours. You’re hearing about it today because we’ve been having rain and I can see it in our trees again! This gives you a clear picture of why the Holy Spirit is often referred to as water. Water gives life. The Holy Spirit gives us life through surrendering to Jesus and never leaves us. He is living water, and we will never be thirsty again! We are very similar to that fern. When we turn our back on Jesus, we begin to dry out and shrivel up. We aren’t dead, but the further away from Jesus we wander, the more dry we become. We just need the Holy Spirit watering us back to life. Fill up on Jesus and the Holy Spirit every day! Happy Mothers Day! Today is a day full of great joy for many, but for others, it’s a day that reminds them of their loss. No matter what, it’s a nice day to honor her or her memory for all she has done for you. Most of us mom’s can’t live up to the expectation that the Proverbs 31 mother set, but each of us fit it in some parts, so don’t be hard on yourself if you don’t. God must feel strongly about honoring your mother because it’s one of His commandments. Don’t grieve yourself if you feel you can’t honor her, some mothers have been absent, forgive her. Hopefully someone else stepped up to fill in for the lack. Remember, this is a man made holiday and your mothers should be honored every day. May God bless this day and fill it full of joy!